The Prancing Horse emblem is perhaps one of the most recognized brands in the world today. It is synonymous with speed, lifestyle and class all around the world especially with its proud name of Ferrari. No matter where anyone goes, Ferrari is always seen in the highest level among car lovers and just about anyone. Ferrari epitomizes everything the automotive industry is all about and has been the trademark of supercars, often being viewed in the same light with the likes of Lamborghini. Ferrari’s iconic logo and brand is now one of the most recognized emblems in the world where it is known for its high-quality and fast cars with a distinct engine sound not emulated by anyone. As such, it is only natural that Ferrari has become a primary force in the world of motorsports where it has won countless tournaments and races including the internationally popular Formula 1 World Championship. Since its launch, the Ferrari 458 Italia has received tremendous response in every market including Asia. This iconic red-coloured supercar is owned and operated by Ferrari S.p.A. Its headquarters is in Maranello, Italy and has one of the oldest legacy in the automotive industry. Founded in 1939, the man behind the success of this brand is Enzo Ferrari. When it started, the company was known as Auto Avio Costruzioni. 1940 was the year when the company built its first car but it would only be 7 years later before the first car with the Ferrari badge was rolled out, thereby establishing the company as a automotive manufacturer. In 1969, 50% of the company was bought by Fiat S.p.A which will then be increased with another 40% some 20 years later. 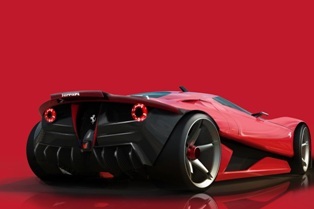 According to Brand Finance, Ferrari is known as the most powerful brand in the world. Its range of models go into the millions including its classic ones. In fact, the 1962 Ferrari 250 GTO became the most expensive car in history after it was sold for slightly more than US38 million in 2012. One aspect of Ferrari which resonates very well is its foray in motorsports. It is one of the most achieved team in the Formula 1 World Championships for decades now. This is managed by its motorsports arm Scuderia Ferrari which has been driven by some of the top drivers in this sport like Michael Schumacher and others. In Malaysia, Ferrari cars are marketed by Naza Italia Sdn Bhd, one of the largest automotive companies in the country. Naza Italia operates a Ferrari showroom in Petaling Jaya where it is the authorized distributor for Ferrari cars in the country. Here is where enthusiasts can view and get up close and personal with the likes of the Ferrari FF or the Ferrari 458 Italia, among others. Like any other parts of the world, the Ferrari brand in Malaysia is perceived in the luxury and super-car category. It continues to turn heads wherever it goes because of its cost and design particularly in terms of its iconic engine sounds. Apart from that, Naza Italia operates the Naza Italia Lifestyle Center which is a one-stop center offering everything Ferrari for fans and owners. This is to provide the avenue for Ferrari owners to come together and share information or to mix around with others with the similar interest of driving this excellent vehicle. Meanwhile, Ferrari owners in Malaysia can join the FOCM or Ferrari Owners’ Club Malaysia which organizes all types of events and programmes for members of the club to share resources, information and experience about this supercar. NextHow to inspect a used-car?